The Jeff Thomas era at Georgia State has finally arrived. The 6-foot-5 inch Norwalk, Ohio native has joined the Panthers after spending last season academically ineligible. The news that he would not be able to be a part of the 2014-2015 Panthers hit Thomas hard, but Thomas was able to find positives even in what would be a dark time for any student-athlete. After redshirting last season and Thomas now has four years of eligibility remaining. Thomas played his high school basketball at Norwalk High School where he averaged 18 points per game in his senior season. Thomas was expected to be a key contributor for the Panthers in 2014-2015, but with the NCAA’s ruling Thomas now comes to a different Panthers team and could be counted on even more than first expected. Thomas’s arrival comes right in time as the Panthers lost their top two scorers off last season’s team in R.J. Hunter and Ryan Harrow. The Panthers must find another scoring threat. Most would look to other players on the oster. There are some notable returners in Kevin Ware, Isaiah Dennis, Markus Crider, T.J. Shipes and Jordan Session who all received significant minutes last season. But these players are not necessarily the scoring threat that Hunter and Harrow were. The team will need to use its assets to play a more team-oriented offensive style. Enter Thomas. Thomas has the potential and measurables that can make him that unique threat that the Panthers enjoyed the last few seasons with Hunter. Thomas has earned praise for his shooting ability, size, defensive presence and a high basketball IQ. Thomas also has unique height for his position.As a shooting guard and small forward, Thomas’s shooting ability will make it difficult for defenders to guard him outside and inside. e will be bigger than most shooting guards he faces, faster and able to shoot over many small forwards. Coach Hunter isn’t handing Thomas any playing time, though. Thomas will have to perform at a high level to even carve out a key role with the team. Thomas has already shown that he has a strong work ethic and the ability to handle adversity. In fact, the game he loves being taken away from him has made his work ethic even better knowing that nothing can be taken for granted. Though he was away from the team, Thomas still made time to work on his craft and improve portions of his game, though he does admit that he was a little out of shape after the long layoff. Thomas’s improvements have also been noticed by coach Hunter and commended effort while away from the game. “Last year, he continued to work on his shot and study the game of basketball. At the end of the day, everyone can always improve and I think he took the opportunity to get better rather than just sitting around waiting for this season,” coach Hunter said via email. Coach Hunter has been there for Thomas since from the start. Since Thomas was ruled ineligible Coach Hunter and Thomas kept a close relationship and kept constant dialog between themselves. “I’d talk to him about three times a week. I’d go to his office we would sit down, and he would just check in and that made me feel comfortable,” Thomas said. It was coach Hunter that pushed Thomas to be proactive and attack the time off and make something out of the time off. “I told him to just keep working hard and that everything would work out. Sitting out a year can either really hurt a student-athlete or it can help them. I think it has helped Jeff. It wasn’t always easy last year, but now he can see the finish line of starting this season and I think that is pushing him even more,” coach Hunter said. The Panthers will see the benefit of that work soon. Thomas has matured and grown as a student as well as a player. The unfortunate circumstances of Thomas’s first year at Georgia State may be in his rearview, but they may be what shaped him into the great player and student that he may very well end up becoming. Whatever happens in the coming months and years for Thomas he will be ready to face head on, and Panthers’ nation will witness the potential development of what could be the Panthers’ next big basketball star. 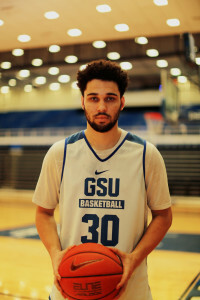 Thomas’s redemption will be one of the most intriguing stories that is still being written at Georgia State.